Little Learners has been operating in Drumcondra Dublin 9 since 2011. We are a privately owned pre-school and after-school. We offer ECCE and non ECCE places and full and part time care. The school operates from 9 am to 12 noon for ECCE children but additional care is available from 8.30 am to 6pm. 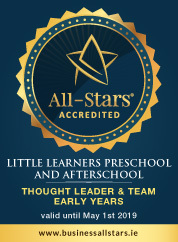 We accept children from ages 2 years and 10 months to 6 years of age. Little Learners was awarded the 2015 Early Childhood Ireland Innovation Award for Innovation in Relationships and Partnerships. We use the Montessori Method which teaches the child to learn to do it themselves. Little Learners have been given the opportunity to establish a pre school and morning and afterschool service in Ballyshannon National School from September 2018. Click here for Ballyshannon information. We offer a unique service which puts the children’s happiness and comfort at the heart of all our activities. We recognise that after schoolers have particular needs and have developed our service after extensive consultation with both parents and children. Your child will have access to a genuinely varied and exciting range of activities. These change depending on the interests and skills of the leaders. We have access to a large fully equipped dance studio, garden and childrens village. Did you know that we provide an Award Winning After School Programme? Our Pre-School & Montessori operates for 38 weeks a year in parallel with the national school year. Get the latest updates relating to all our activities, events & camps. Did you know that we host a babysitting evening on the last Friday of every month from 6-10pm in the ABCD building. This is to provide parents with the opportunity to go to the cinema, avail of an early bird meal etc. The cost is 20e for a child or 25e per family. Children are invited to come in their pyjamas and enjoy a movie and some fun. If this would be something that would interest you, let us know. It is vital that you book in advance. It is even more vital that children are collected by 10pm as the success of the scheme is that parents get a night out but staff get home at a reasonable hour. All funds raised will be used to purchase the new equipment for the garden in ABCD.